On a risk/reward basis, General Electric beats the richly rated 3M. Yes, you read that headline correctly: General Electric (NYSE:GE), with all its problems and uncertainty, is a better-value stock than 3M (NYSE:MMM). The argument is based on GE being a better risk/reward proposition right now, rather than it being a better-quality company. Here's why. Starting with 3M, it's hard to argue that there is a lot of upside potential with the stock. 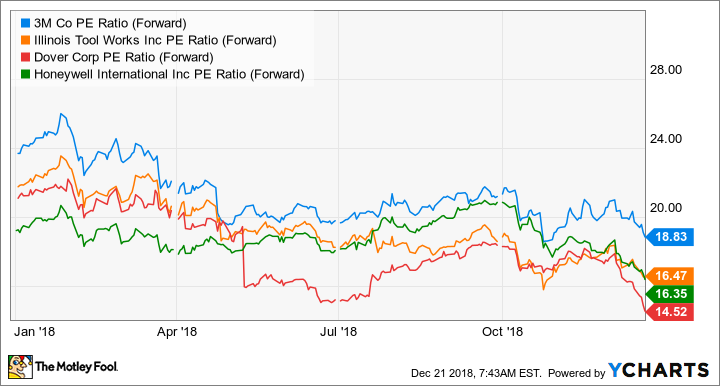 Thanks to its excellent history of generating returns for investors, 3M has traded at a premium to its peers and competitors -- it currently trades at a P/E of 26 times earnings. Moreover, as you can see in the chart below, the stock trades at a significant premium to its multi-industry peers. It does so because of its long-term history of generating returns -- the stock is a dividend king, having generated 50 years of consecutive dividend increases. MMM P/E ratio (forward) data by YCharts. That's all well and good, but the question is: Where can the stock go from here? It's pertinent, particularly as there are question marks surrounding the company. Indeed, this year has been far from vintage for the company. 3M's management started the year expecting 3% to 5% organic sales growth, only to reduce the forecast to just 3% come the third quarter. There are concerns that its recently announced midterm targets are too optimistic, particularly as 2019 is set to be a year of slowing economic growth. Moreover, two important businesses appear to face strategic challenges. Around a third of the company's consumer-segment sales come from its stationery and office supplies business. The problem here is that its traditional customers are facing significant competitive threats from online businesses. Meanwhile, 3M's oral-care business (around 25% of its healthcare segment) is a serial underperformer. Underperformance in the dental sector has been a common theme among industrial conglomerates lately. Danaher (NYSE:DHR) is set to spin off its dental segment after a period of disappointing results. All told, 3M's healthcare and consumer segments have question marks around them, its valuation looks expensive on an absolute and relative basis, and its midterm guidance looks optimistic. Turning to the much-maligned GE, it's hard to know what guidance new CEO Larry Culp is going to give for 2019 and beyond. But it's reasonable to expect low single-digit margin guidance for GE Power -- it's what Siemens expects in 2019. The power segment may well face challenges now, but GE still has a huge installed base of equipment -- GE equipment produces more than 30% of the world's power -- from which it can generate service revenue. Moreover, GE Aviation and GE Healthcare are doing fine right now -- the two are expected to produce a combined profit of around $10 billion in 2017 alone. And aviation has a long-term growth opportunity from servicing the LEAP engine -- the engine of choice on the Boeing 737 MAX and one of two options on the Airbus A320neo, two narrow-body aircraft set to dominate the market for years to come. GE Capital is the hard-to-predict variable. Concerns exist around its potential tax and insurance liabilities. And the company may yet need to raise equity -- which will dilute the holdings of existing shareholders -- in order to generate cash to meet near-term funding requirements. 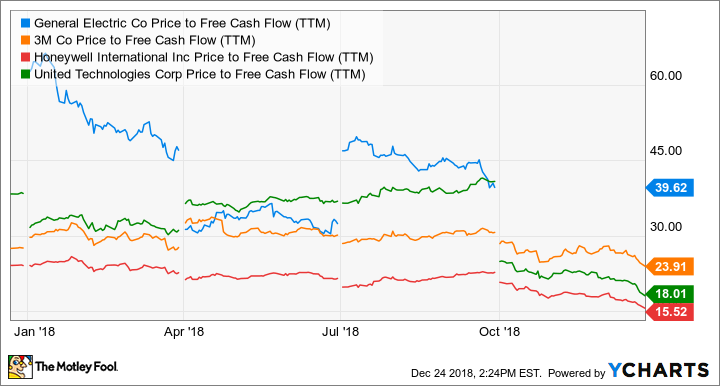 That said, if GE can generate around $4 billion in industrial free cash flow (FCF) in 2018, and Culp forecasts growing FCF in the years ahead, then the company's valuation will start to look very attractive. For example, a reasonable FCF target of, say, $4.8 billion in 2019 would put GE on a forward price-to-FCF yield of 13.5 times FCF. That's a figure significantly below the current valuations of its peers and, of course, the expensive looking 3M. All told, even though 3M is a better-quality company, the upside potential of GE's stock makes it a better buy right now. To be clear, there are significant worries around GE. And don't be surprised if the company faces cash calls from Securities and Exchange Commission fines/charges and funding requirements due to insurance/tax liabilities. But much of this appears to have been already discounted into the stock. Meanwhile, 3M's premium valuation seems to reflect a level of optimism that might not be justified. The current valuation gives 3M stock little upside, and management's guidance looks optimistic. On a risk/reward basis, GE is a better value.